Annie Columbia stood cold as stone until she was brought to life by her sculptor, who fell in love with his work of art. After her steel eyes first opened from the horrendous thundershock of his life-gifting experiment, Annie found herself trapped in a one-sided love affair she wanted no part of. In the larger world, she encountered all of what life had to offer - and found a society that wanted nothing to do with a living monument. Her wish - to become a real person! Annie may be a statue given life, but she's definitely not going to sit idly by as others get involved in a brawl! Her unique power, Manifest Majesty, lends well to players who like to even the playing field, and manage the game in creative ways. In playtesting, Annie often was a dark horse in many a match, utilized by players who saw the potential of her ability as a way to take the health lead and keep it. Each time she throws a Punch at the fighter with the highest health, she gains 2 health of her own, which can turn the tables easily on opponents who have built a healthy advantage. There were matches in playtesting where Annie players easily ran the entire table with creative hits, clever politicking, and massive swings. The Lady of Liberty lends herself well to players who want to manage the table, claim the lead, and stay there. It supports a really clever play style since it generates a lot of health for you to play the table with. The key to playing Annie is always keeping another fighter within a few points of health of yourself so you can take some hits and then have someone to go after to get back up on top. Using your health as a resource creatively will keep you in the lead as you get into the one-on-one close combat round, and Annie's ability is one of the few that still has amazing utility during that round as well. 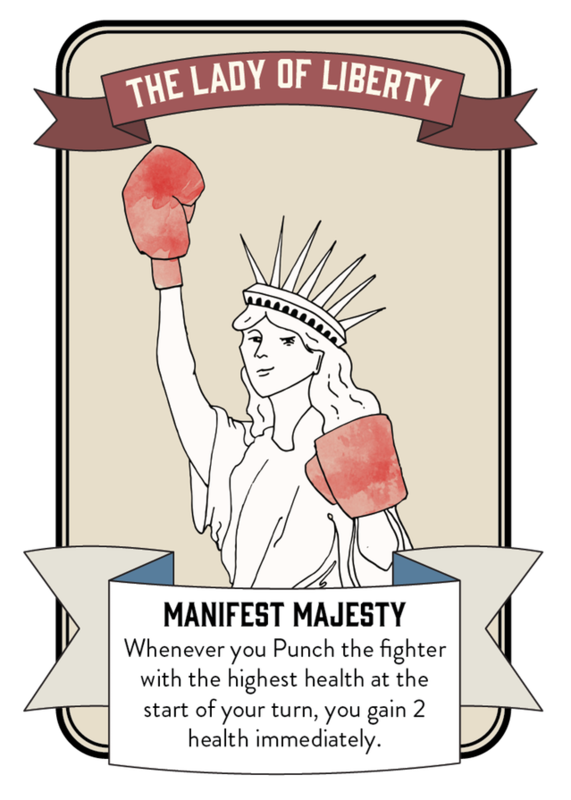 The Lady of Liberty still has her share of drawbacks, notably that when she gets too low in health, the two health she'd gain on attacking the life leader might not be enough to keep her in the match. Fighters can easily gang up on her to take her out of a commanding lead, and once she's out of distance of the top spot it could be very difficult to catch up. Our tip: Keep the table even, as best you can. Everyone's going to take hits and lose health - the goal is to be the last person standing, not the last person standing with perfect health. By spreading out the damage you can keep one person from taking a commanding lead that you can't claim - your goal as Annie should be to be on top of the heap in terms of health at almost all times, but never so far that you cannot take a hit and heal it back up in your next swing. Additionally, try to convince an ally with a health advantage to take a hit from you to give you some health! You'd be surprised how often that works. The Lady of Liberty stands for equality - especially of health totals!